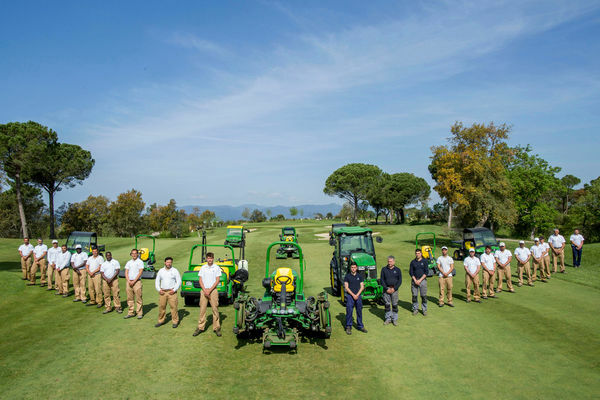 PGA Catalunya Resort, near Girona in Spain, has signed its first ever five-year preferred equipment supplier agreement with John Deere to provide a fleet of 10 new Gator utility vehicles, as part of its three-year investment plan. The European Tour Destination, renowned for its commitment to first-class course maintenance, has already been using John Deere 2500E hybrid electric triplex greens mowers, 9009A TerrainCut rotary rough mowers, 2030A ProGator utility vehicles equipped with HD200 low-profile amenity turf sprayers and TX Turf Gators. The new five-year deal, supported by John Deere Financial and including PowerGard maintenance cover, sees the addition of two more ProGator vehicles and three rough mowers to the fleet, as well as two compact tractors, supplied by local dealer Ramon Font of Vernis & Taberner Equips, SL. ?Being home to Spain’s No. 1 course since 2011, expectations on how our courses play, look and feel are high, so the machinery we need must produce a consistent, first-class finish – and in John Deere’s equipment we have well-engineered and reliable machinery, which our mechanics appreciate,? says Alfredo Alvarez, Stadium Course Manager at PGA Catalunya Resort. ?The greens staff really like the mowers’ quality of cut and the precision that can be achieved using the programmable TechControl display. Alvarez works alongside Tour Course Manager Roger Casadevall and Head Greenkeeper Aleix Masferrer, heading up a team of 21 greenkeepers and two mechanics who dutifully maintain the two championship courses to the highest standard. ?Following the recent Continental European course listing by www.top100golfcourses.com, we discovered the judging panel had specifically commented on the ?immaculate conditioning’ of the Stadium Course – and thanks to John Deere’s superior turfcare machinery, we will uphold our course conditioning standards to the highest level,? says David Bataller, PGA Catalunya Resort’s Director of Golf Operations. This investment in the future of PGA Catalunya Resort’s two championship courses is part of a ?53 million redevelopment programme that has seen the opening of two new hotels, the addition of a new vineyard, sports and leisure facilities, and a wide range of services and activities since its conceptualisation in 2016. The addition of an equestrian centre and a man-made recreational lake will complete the estate’s transformation into one of Europe’s most desirable luxury lifestyle destinations at less than an hour from Barcelona and 15 minutes from the historic town of Girona, in north-eastern Spain.